I am curious. 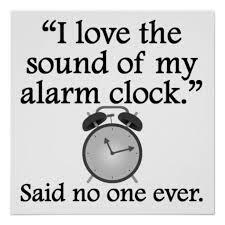 Can someone please explain to me why I am wide-awake at you’re-kidding-me a.m. Saturday when I could sleep in, and yet when that weekday alarm rears its ugly head I can barely lift my hand to smack the snooze alarm? Am I the only one who is baffled by this phenomenon? A few days before First Born's wedding I took some time off to be involved in the preparation. Since the wedding was during Memorial Day weekend I also had the advantage of relaxing on Monday, sort of. All in all, I was away from my normal work schedule for 5-1/2 days. Here’s what I don’t get. During that time I could not sleep past 5:30. It wasn’t just because, as Mother of the Bride, my head was swimming with last minute details. It didn’t have to do with packing up to go home the day after the nuptials, or even the fact that Spouse volunteered us to help with the water station at a local race on Memorial Day (an annual tradition that he couldn’t say no to, even when I gave him The Look). I was consistently up long before it was necessary, showered and sipping coffee before anyone else had even moved. After all was said and done and married, it was back to the normal routine. Tuesday morning came along and my alarm clock was playing sweet, soothing music at 5:28 a.m. (we will discuss the oddity of the time in another post). Honestly, It didn’t matter how sweet the music was, or that I had no problem waking up even earlier than this ridiculous hour for the last several days. Something internal knew it was a workday and my brain and body were having none of it. I hit the snooze three times before I even tried to pry open my eyes. It was going to be a long four-day workweek. How does this happen? Does the universe send out different signals on the days you can sleep in, so that you get such a good night’s sleep you don’t need to stretch your consciousness into daylight? I don’t think so – I was up since 4 in the morning the day before the wedding. I was desperately in need of a nap by the time we got to the rehearsal at 3 p.m.
Of course, we do have to take into consideration the magical powers of the sofa, which can somehow lull me to sleep no matter how intriguing a 2008 episode of NCIS may be. Not that I fall under its spell often, but Spouse does, his head bobbing up and down in rhythm with his snoring (we won’t discuss the drool). I try to just hit the sack once my head starts to bob (mostly because I don't want social media to be gifted with a picture of me drooling). I envy people like Spouse who can sleep through anything. Anywhere. Anytime. Usually I let him snooze away on Saturdays because I do actually enjoy a little time to myself when I don’t have to march to the beat of a schedule. If we ever have summer here in Maine, I’ll be sitting in the back yard with my coffee, reading the newspaper from three weeks prior. First Born is very much like me, crawling through the weekday mornings. But when the weekend hits she and The Groom (it’s been three weeks - time for an update) are strolling the streets of Philadelphia by 8:30 or 9 on the way to one of their favorite breakfast places. Second Born is fine with not waking up until 10 a.m., and on a rare occasion, later... though due to an early work schedule this summer, her body is now convinced 9 a.m. is late, much to her annoyance. She does have the going-to-bed-early thing down pat at the moment, due to her work schedule... and it also may have to do with how boring her parents are after 7 p.m.
Maybe I’ll try not eating after 6 or not playing card games late at night, and see if that helps me to sleep in. Or maybe I’ll just take my pillow and move to the living room sofa and soak in its magical snoozing powers.